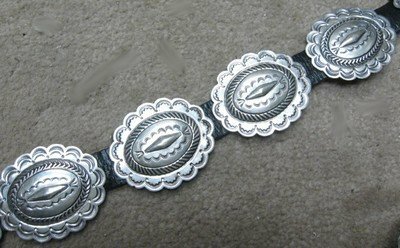 This Dead Pawn (most likely Navajo) sterling silver concho belt was obtained from a great little pawn shop in Gallup, New Mexico. All the jewelry from this pawn shop was pawned by Native Americans living in the local area. Gallup is the pawn capital of the Southwest, close to the Navajo and Zuni reservations. 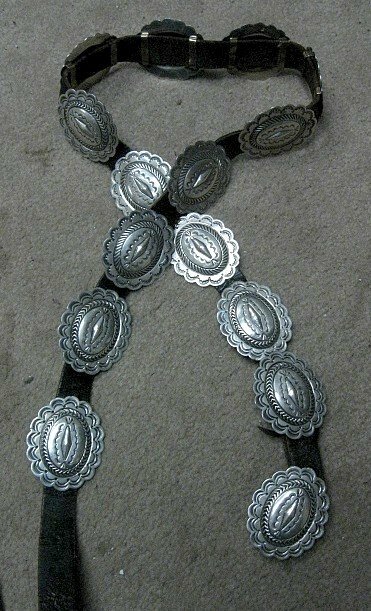 This concho belt has 15 silver conchos including the buckle attached to a 3/4 inch wide leather belt. 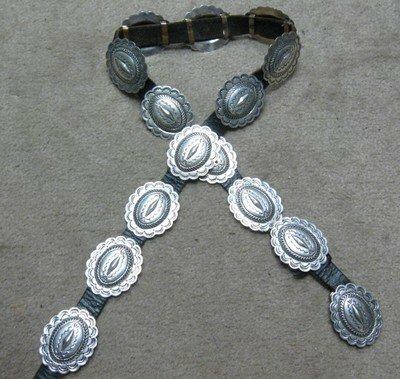 The oval conchos measure about 2 inches long by 1-5/8 inches wide, are made from sterling silver, are affixed to the leather belt with copper slides and can be adjusted as needed. The 3/4 inch wide dark brown leather belt is relatively worn but still in good shape and has a total length of 44 end-to-end. There are holes punched at the 35, 36, 37, 38, 39, 40, 41 & 42 position. But I can punch additional holes for you as needed. 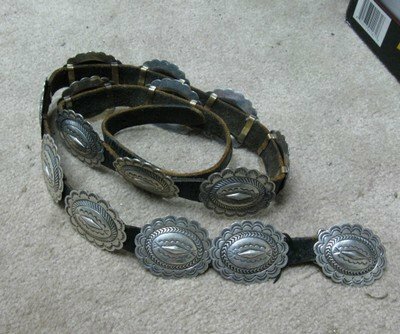 The exact age of this concho belt is unknown. The buckle is hallmarked RJ and Sterling.